The discovery of the human immunodeficiency virus (HIV) by the French scientists Luc Montagnier and Françoise Barré-Sinoussi in 1983, and the, and the subsequent confirmation by the American scientist Robert Gallo that it caused AIDS was a shock to doctors and scientists around the globe, and begged the question as to whether or not similar viruses existed in other species. They did not have to wait long, in 1985 a virus was identified that caused AIDS in Rhesus macaques. Analysis of the new virus showed that it was a retrovirus closely related to HIV and it was christened simian immunodeficiency virus (SIV). Since then more than 40 different strains of SIV have been identified in a number of African primate species but a curious pattern was quickly noted; individual SIV strains rarely cause disease in their natural host, for example SIVsmm naturally infects sooty mangabeys but does not cause AIDS in them. On the other hand Asian macaques in the laboratory are infected by a strain of SIV closely related to SIVsmm they develop AIDS. It is thought that over thousands of years natural hosts of SIV have evolved ways of restricting the spread of SIV in their bodies and limiting the damage it can do. If we can identify the mechanisms through which primates limit virus infection we might be able to order to develop treatments that work along similar principles for those of us not fortunate to have natural resistance, and perhaps develop powerful new anti-viral medicines. Five years ago scientists found that some of the variability between species in the ability to restrict HIV or SIV is due in part to differences in the structure of a protein known as TRIM5alpha that prevents the virus from reproducing within the cell, the structure of TRIM5alpha in African monkey species makes it an efficient blocker of SIV and HIV but different structures in macaque TRIM5alpha mean that it has a low blocking effect against SIVmac while human TRIM5alpha only weakly blocks HIV (1,2). With greater understanding of the differences in TRIM5alpha structure between species and how this effects function we may be able to develop new drugs that replicate its action and block HIV in humans. So are humans the only primate in which naturally occurring retroviral infection causes AIDS? Until this week the answer would have been “probably”, because no one knew for sure whether the SIV found in chimpanzees, SIVcpz causes AIDS. There had been reports that it might but no firm evidence one way or the other. 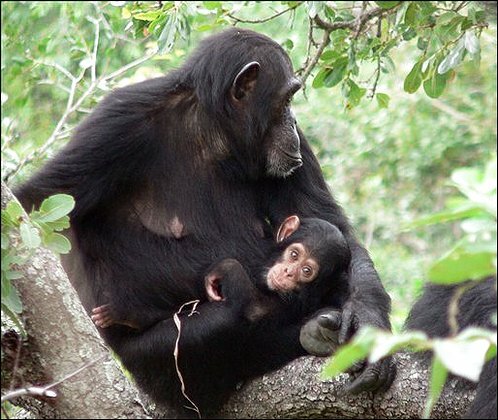 In this week’s issue of Nature an international team of scientists from institutions including the, Yerkes National Primate Research Centre and the Jane Goodall Institute and lead by Dr Beatrice Hahn of the University of Alabama at Birmingham report that SIVcpz does cause AIDS in a subspecies of chimpanzee found in Gombe National Park in Tanzania (3). In infected animals it was associated with a 10-16 fold higher risk of that, lower than that seen in humans infected with HIV-1, the main cause of the AIDS pandemic, but higher than that seen in humans infected with HIV-2. Comparison of the number of CD4+ T-lymphocytes, the same immune cells killed by HIV in humans, in SIVcpz infected monkeys with that in uninfected humans and chimpanzees showed that SIVcpz infection lowered CD4+ T-lymphocyte dramatically. By contrast they found that in sooty mangabeys infected with SIVsmm the CD4+T-lymphocyte count stayed high and there was no progression to AIDS. This report is important for a number of reasons. First of all SIVcpz is the strain of SIV most closely related to HIV-1, indeed phylogenetic analysis indicates that it is the direct ancestor of HIV-1. The scientists involved in this study hope that by studying the course of SIVcpz infection and comparing how it interacts with the chimpanzee immune system with the behavior of HIV in humans and other SIV strains in monkeys they can gain a better understanding that will lead to improved treatments and the development of effective vaccines. Secondly SIV is thought to have crossed into chimpanzees from monkeys that they eat only about 500 years ago, so the observation that it still causes disease in chimpanzees will be of great interest to those studying the evolution of resistance to viruses. This brings us on to the third reason why this study is important, chimpanzees are an endangered species and this disease is a threat they could do without, so scientists are keen to determine whether infection with SIVcpz leads to AIDS in other chimpanzee subspecies, and whether it has a significant impact on the overall number of chimpanzees. If the threat is found to be serious than perhaps we should be thinking about developing a vaccine against SIVcpz as well as against HIV. Posted on July 25, 2009 July 25, 2009 by EditorPosted in News, Science NewsTagged aids, animal research, animal testing, browne, Chimp, Chimpanzee, Chimpanzees, Chimps, hiv, Jane Goodall, Macaques, paul browne, retrovirus, Robert Gallo, SIV, speaking of research, TRIM5alpha, vivisection, Yerkes. In yet another report on diseases that affect both humans and chimps scientists led by Stephen Rich from the University of Massachussetts have found that Plasmodium falciparum, the parasite responsible for most cases of human malaria, evolved relatively recently from a parasite named Plasmodium reichenowi that causes malaria in chimpanzees. Ed Yong has more over at his “Not exactly rocket science” blog.